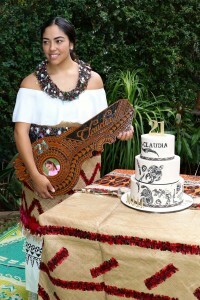 Our team at exquisite cakes was lucky enough to bring a very special Tongan inspired 21st cake design to life. This unique three-tier fondant cake maintained intricate detail that was hand painted by one of our decorators. 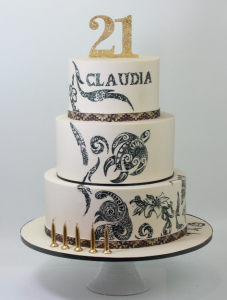 Claudia had designed her own cultural tribal tattoos that are significant to her family, this then became the main feature of her 21st celebration cake. Tongan tattoos are culturally significant and can mean many things however these tattoos are mainly personal to the wearer. Claudia has tribal tattoos that she had designed herself to represent her family. She designed a tribal turtle for her Dad after his sister had passed away who was known as Auntie Turtle. The stingray is to honor her grandfather as it is his spiritual animal and the dolphin is to honor her Dad as it is his spiritual animal. 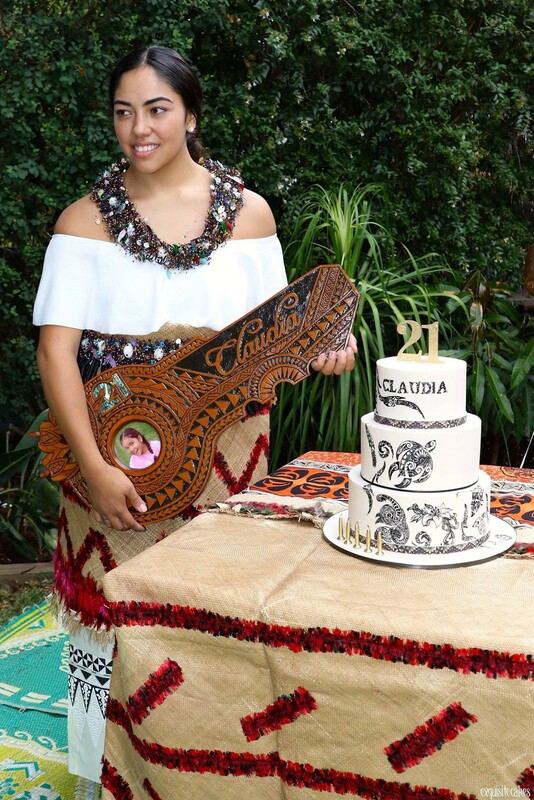 The tattoo designs were positioned strategically in order for them cascade down the three tiers whilst incorporating a tribal ribbon wrap at the bottom of each tier. This enabled all elements to be incorporated in the design making it extremely appealing to the eye. By doing this, it enabled all elements to be an appropriate size in which showed each individual aspect of each design. This showed the detail of the different cultural designs and how they can be incorporated into not only an image but an animal. The mat on the cake table is over 100 years old. Tapa mats are prized, expensive and can be very beautiful and intricate. These are worn at special occasions and represent the connection to the land. We absolutely loved designing and creating this specialised cake. If you have a design that you would like to see come to life, just call our store on 88501340 and we can make it happen! You can also just visit our website to see other designs we have created.